Oh how I love Paul Smith, true British style, elegance and fun. I’ve been a fan of Paul Smith fragrance for years and have owned ever single one of them, they always have lovely packaging and delightful fruity, floral fragrances. My favourites have been Floral by Paul Smith, which comes in a quite odd bottle that resembles a babies bottle, the scent it is a delicious grapefruit based fruity scent, perfect for the Summer. I also love Rose by Paul Smith, a combination of traditional rose scent with a mixture of green tea, violet and magnolia, due to the rose oil content, the price tends to be higher, but it is just a perfect rose based fragrance. Paul Smith have recently launched their latest scent, Paul Smith Optimistic, by the look of the advertising they are aiming at a younger audience than normal, the latest advert looks like it would come from Abercrombie or Jack Willis, rather than Paul Smith, which I would always connect with a moreÂ sophisticatedÂ audience. Never mind though, as it’s a nice image and all the models look very English and happy, which reflects the idea behind the fragrance. 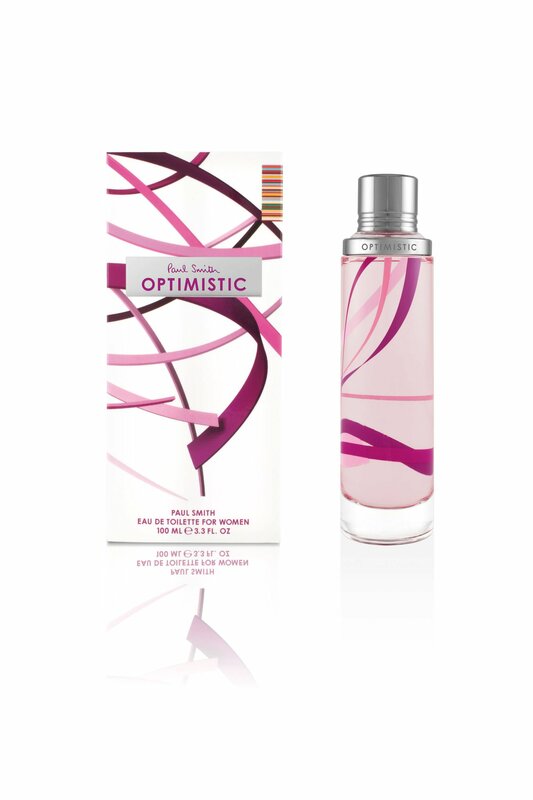 Paul Smith himself, says that:Â â€œI wanted to create a fragrance that bottled the spirit of optimism â€“ that captured the youthful enthusiasm and energy I see around me every day. Itâ€™s about time that someone made a positive statement,â€ Which is a lovely idea, and makes me understand the ideas behind the promotional material. “Top notes â€“ A colourful fragrance: Optimistic for Her is inspired by pink shades and fuses pink berries, pink grapefruit, juicy litchi and elegant sweet peas. Â Heart notes â€“ An upbeat fragrance: Optimistic for Her features energetic mandarin freshness twisted with the vitamin kick of cranberry and the soft but vibrant raspberry â€œmacaroonâ€ accord. Sounds delicious doesn’t it? My main excitement comes from the mention of “raspberry macaroon accord” and “pink berries”, it makes my mouth water. And makes me want to buy macaroons desperately. “Top notes â€“ An upbeat fragrance: Optimistic for Him has a vigorous and joyful impact with sparkling citrus and mysterious and exotic pepper and cardamom. Â Heart notes â€“ A fresh fragrance: Optimistic for Him gives an impression of virile marine freshness through its sage and geranium notes. My husband’s signature fragrance when I met him was theÂ originalÂ Paul Smith fragrance for Him, in the green bottle and it still makes me smile. Lovely scent. For me, I feel optimistic when the morning is sunny and the birds are singing, I love living somewhere pretty and with that start to the day, it just makes want to go outside. I feel optimistic when I walk through the local park and see all the happy people walking their dogs, I also love seeing the deers in the park too. Check out the Paul Smith Optimistic Facebook fan page for competitions and updates! ← Competition: Win Sugarlesque Heart Shaped Pasties!